The national eye is officially off the Seahawks. Former New York Giants player and current color commentator said this while criticizing Seattle for their undisciplined play on Sunday, “That’s why they are where they are now.” It perfectly captured the general perspective that has taken hold around the NFL that the Seahawks might still be tough, but their best days are behind them. Yet, here they stand at 4-2, with a win over the darling Los Angeles Rams on the road, winners of three straight, and once again atop the league in scoring defense. They welcome in the fresh and fun Houston Texans, with their rookie star quarterback, Deshaun Watson. He is deserving of the attention and praise after throwing for 14 touchdowns in his last four games, but there was a time when a rookie quarterback traveling to face the Seahawks defense in Seattle was like a lamb going to slaughter. That fear factor has largely dissipated. Coming off their best two defensive games of the season, the Seahawks look like a team ready to take the swagger back. The Houston defense is better than people think. It is better than I gave it credit for after J.J. Watt, Whitney Mercilus, and Brian Cushing were all lost for the season. They have some new names who have stepped up on the defensive line, and playmakers at every level of the defense. They are not outstanding at any one thing, but are good at pretty much everything. The Patriots and Chiefs put up a ton of points, and the Jaguars benefitted from a dumpster fire performance from the Texans offensive line and then-quarterback Tom Savage in week one, which has inflated their points allowed totals. They have not allowed more than 17 points in their other three games. Seattle’s offense has actually climbed above the Texans in yards, yards per play, passing yards, and a slew of other offensive categories. The Seahawks have averaged a respectable 28.3 points and 394 yards per game over their last four contests. They may have struck gold in rookie Ethan Pocic at left guard, who was perfect in pass protection in his first action this Sunday. This will be just their third home game of the season, and first since putting up 46 points against the Colts. Remember the name Christian Covington. He caught my eye when watching the Texans play the Patriots earlier this season. He was the best player along their defensive line that day, and that was when Watt and Mercilus were still playing. He has continued to be a quality performer in the middle, and teams with another lesser known talent in D.J. Reader, to form a menacing interior defensive line. Given that Justin Britt is questionable for this game with an ankle sprain and the guard spots are still a question mark, those two players could be major problems for Seattle. What’s worse, athletic freak Jadeveon Clowney will face off against Rees Odhiambo all afternoon. Clowney has not been a world-beater so far this year with 3.0 sacks and just 18 total pressures, but Odhiambo has been a turnstile against nearly all comers. There was a glimmer of hope against the Giants when he played his best game of the season, but Clowney is a much tougher test. Houston also has been one of the best team’s in the league at creating turnovers. Arguably, that has been the key to their season. Jonathan Joseph is a ballhawk at cornerback. Andre Hal has a couple of picks at safety. Nine different Texans defenders have forced fumbles this season. Just four Seahawks defenders have done it. The Texans also get back one of their starting cornerbacks in Kareem Jackson from injury. The Seahawks offense has been emotionally abusive. They looked ready to breakout during the preseason and then looked worse than ever in the first two weeks of the regular season. They were atrocious in the first half against the Titans before erupting for 20 points and oodles of yards in the second half. The same thing happened against the Colts the next week. Then they were mostly inept in Los Angeles before putting together their most complete game of the season in New York against a talented defensive line and secondary. Points were not consistent in New York, but gaining yards absolutely was. With 220+ yards in the first half and over 200 yards in the second half, the Seahawks looked more comfortable and dangerous than at any other point of this season. Had Jimmy Graham caught a few easy passes and Russell Wilson made a couple deep throws, the final tallies would have been eye-popping. This is a Texans defense that does not have some of the star power the Giants had, but is playing better football this year. Brennan Scarlett has taken over for Watt, and will be opposite Germain Ifedi. There is potential for some rushing lanes to open on the right side of the line. The Texans weakest aspect of their defense has been against the run. The Texans have also struggled at covering 2nd and 3rd receivers. Houston ranks 14th in the NFL in yards per game allowed to opponents #1 receiver, but just 31st in defending #2 receivers and #25 in defending other receivers, per FootballOutsiders.com. This could be another game for Paul Richardson and Tyler Lockett to step forward. Will Fuller has returned at wide receiver to give the Texans a big boost in the passing game. He has five touchdowns in three games, and is a lethal deep threat. DeAndre Hopkins is among the best receivers in the game, giving the Titans possibly the best 1-2 punch going right now. Watson throws a nice deep ball, and trusts his players to make a play. He also is a dangerous runner, with over 200 yards rushing and 2 touchdowns. His running ability has elevated the Texans rush offense rankings. Starting back Lamar Miller is a good player, but is only averaging 3.8 yards per carry. Watson is the type of player who wills his team to victory and will make plays where none should be possible. He has the weapons and confidence to give any defense fits, and is welcoming back their left tackle Duane Brown, who is a huge upgrade for a line that desperately needs it. Watson has earned the praise he has received, but he is still a rookie, and is still making rookie mistakes. Watson has put the ball in harm’s way more than his numbers would indicate. He has five interceptions, and very easily could have a handful more. He has never faced a defense like what he will see on Sunday, and his toughest road game was against the Patriots in one of the quietest stadiums I have ever experienced. The toughest defense he has played is the Bengals, and he had 125 yards passing while managing just 13 points. This Seahawks defense is another level of monster. Seattle has faced some of the better pass-blocking offensive lines, and quarterbacks who like to get rid of the ball quickly. 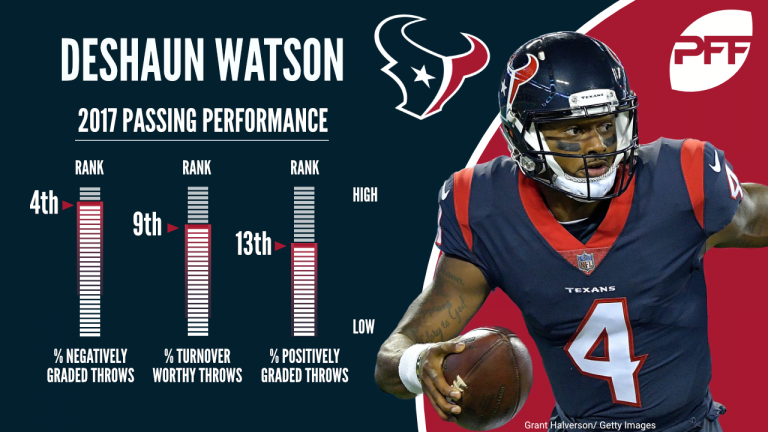 The Texans have one of the worst lines in football, far worse than Seattle’s by most major statistics, and Watson holds onto the ball longer than any quarterback in football, per ProFootballFocus. Dwight Freeney was just added to the roster for Seattle, and should be ready to play this weekend. Believe it or not, the 37-year-old defensive end was 10th in the league in pass rush productivity among 4-3 defensive ends last season. He could contribute right away. Branden Jackson is the #1 overall pass rusher in terms of productivity among 4-3 defensive ends this season (min 20 snaps). He’s the Seahawk player earning more chances each week. Sheldon Richardson and Michael Bennett should have field days, and Bobby Wagner could find his way to some more disruptive sacks. Few teams are as good at taking away the deep pass as Seattle. Watson and his crew will need to throw into the teeth of this defense. He is not a dink-and-dunk quarterback. He wants chunk plays. Advantage Seattle. Richard Sherman is playing his best football in years. Shaquill Griffin has excelled in defending the deep pass, and Justin Coleman has been rock solid at nickel. There just are no weaknesses no this defense. Watson may see his luck run out with risky throws going unpunished. Houston has been dangerous in punt returns, but the Seahawks coverage teams have been great lately. Seattle is yet to produce much in the return game themselves. It may be time to give J.D. McKissic a shot. Clowney vs. Odhiambo, hi-yi-yi. Hawks may need a TE to chip block over there, and no empty backfield sets, I hope. Or put Mr. Tobin over there, instead of Luke or Nick. I can understand why the national media has the perspective that the Hawks have peaked, that they’re thinking that Seattle is still a tough out, but not a deep contender. What the national media doesn’t understand is that they may be wrong.